aFire USA is a manufacturer, so it manages production and maintains a large inventory. Our products are shipped by large specialized companies such as DHL, TNT, TPS, etc. Generally, inserts and fireplaces are delivered within ten working days. What is the aFire USA Guaranty? All aFire USA products carry a 2 year guaranty against defect in parts or workmanship. We will either repair or replace your unit if found to be defective. What is availability of service and replacement parts? All aFire USA products are made using high quality materials and components. Each unit is monitored and tested during assembly and prior to shipment. aFire USA devices are designed so anyone, without any particular skills, can easily replace a part in just a few minutes. Spare parts are stocked in our High Point, NC warehouse for quick turn-around. Ethanol, or CH3-CH2-OH bio-alcohol, is a modern combustible fuel made from plants or waste; it is considered a renewable energy source and is an eco-friendly alternative to traditional fossil fuels. When burned, it produces no odor, smoke or toxic exhaust as long as sufficiently oxygenated in an appropriate combustion block such as an aFire USA burner. What type of ethanol should I use for aFire USA devices? The bio ethanol used in aFire USA devices must be liquid (no gel) with a concentration of 95% to 97%. The ethanol fuel used must be specifically formulated for burning in an indoor ventless fireplace. 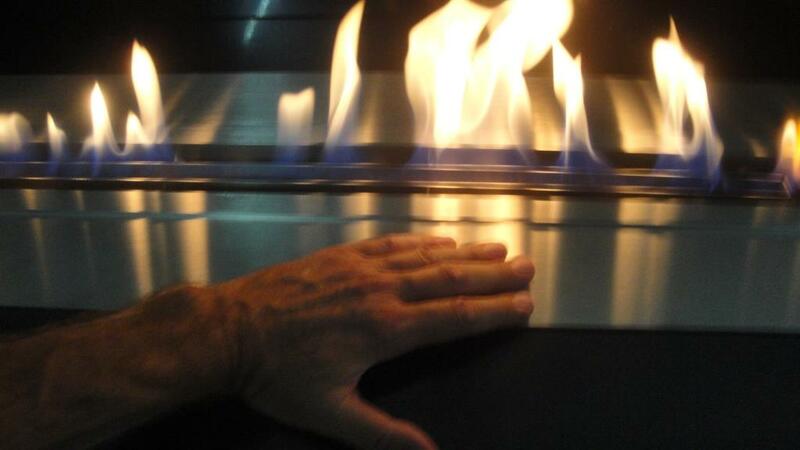 We recommend using only SMARTFUEL™ by Lumina Products, Inc. It it the cleanest burning, safest ethanol fuel on the market today. It is laboratory-tested and specifically formulated for efficient and clean burning in an indoor ventless fireplace. SMARTFUEL™ has been shown not to generate any toxic exhaust. Attention: gels are not appropriate for aFire USA combustion blocks. Vehicle fuel and any other combustible fuels are strictly prohibited from use in all aFire USA products. Do not add any additives to the combustible fuel (perfume, essential oils, etc.). Where can I purchase Ethanol Fireplace Fuel? There are a number of suppliers for Ethanol Fireplace fuel. It is important you select a fuel specifically formulated for burning in an indoor ventless fireplace. We strongly recommend using only SMARTFUEL™ ethanol fireplace fuel in your aFire fireplace. It is laboratory-tested and specifically formulated for efficient and clean burning in an indoor ventless fireplace. It has been shown in laboratory testing not to generate any toxic exhaust. 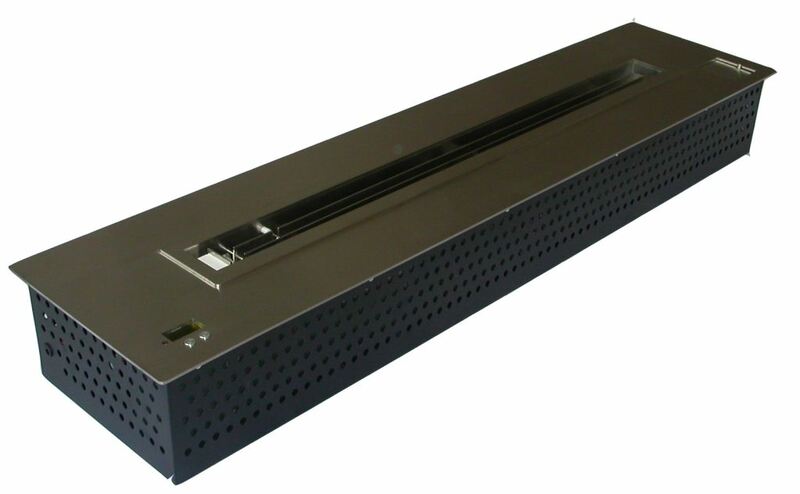 What is the difference between and Manual and Electronic Ethanol Burner? This is simply a box. There is no separation between the burner and the reservoir, so the surface of all combustible fuel (several quarts) is being burned at once. As a result, the heat emitted is very high and spreads throughout the burner and any surface the burner contacts. Especially as the fuel level drops and the flame emits from lower inside the actual fuel reservoir. On the other hand, with an electronic insert, the reservoir and the burner are separated. The burner is constantly fed by a pump. It is smaller in size and is isolated from the body of the device. The insert itself remains cool, and the burner only contains a few centiliters of ethanol being burned at any point in time. Heat transfer is minimized allowing the electronic fireplace to be installed in any sort of housing without fear of heat damage. Safety is always of primary concern when dealing with fire. All aFire USA combustion blocks are automatically and continuously monitored by advanced electronic sensors that will immediately shut down the unit should any abnormal operation occur. These sensors monitor temperature, CO, CO², reservoir fuel level, seismic movement and tipping. The reservoir door will automatically lock should the unit’s temperature be above acceptable range or if the burner is in operation. These are all features not available in a manual combustion block. The most common accidents with this type of device occur when refilling a hot reservoir or one that isn’t entire extinguished. It is imperative that you do not refill a burner when it is hot or a flame is present. It is critical to ensure that the flame is completely extinguished and that the burner is cool. With a manual fireplace, there is no security. Refilling is the main source of accidents, and can be serious. The burner and reservoir are separate, so the reservoir is always cool, even during combustion. Therefore, you are never directly refilling a hot component of the device. The reservoir door is automatically locked if the burner is too hot or if it is working, so this risk is eliminated. These types of safety sensors are not available in a manual device. Purely mechanical devices do not provide a fuel level gauge. aFire USA electronic devices are equipped with a fuel level sensor. An audible and visible alarm warns the user when the reservoir is full preventing spilling of the fuel on the surface of the burner. It also conveniently indicates when the reservoir is empty. How much cleaner-burning is an Electronic Burner? While it is more technical and a bit more difficult to understand, understanding clean combustion is essential. All specialists agree that proper combustion is complete combustion. This means that it transforms all combustible fuel into heat while emitting the least amount of waste exhaust as possible. In incomplete combustion, this residual exhaust can generate dangerous gases such as carbon monoxide. In an electronic device, the burner is small and well aerated. It is permanently fed via a mechanical pump. The gas/air mixture is regulated for ideal combustion and output. In a manual mechanical combustion block, the reservoir and the burner are one and the same, so the lower the level of ethanol, the more difficult it is for oxygen to reach and mix with the gas. This results in incomplete combustion and may create dangerous gas and soot. Many manual devices provide a ‘damper’ to regulate flame size. But this too may create incomplete combustion and generate dangerous exhaust. aFire devices are not equipped with a flame ‘damper’ which prevent access to oxygen. All professionals in the heating and fireplace industry acknowledge a damper of this type is not an acceptable solution. By reducing size of the flame the amount of oxygen available is limited, incomplete combustion occurs producing unburnt materials such as soot (carbon) and also dangerous gases such as carbon monoxide (CO). To light a manual fire, requires bringing your hand near to the fire. You need to use a match or a long lighter. If the burner is hot, gas is produced in abundance. When lighting a flash may occur that will be larger or smaller depending on how hot the combustible fuel is. This detonation can result in a reflex of surprise or fear, and can lead to an unwanted accident. With an electronic fireplace, lighting is done automatically, by simply pressing a button on a remote. There is no need to bring your hand near the flame. With aFire USA you are only lighting a few centiliters of the combustible fuel that has been injected into the burner by the mechanical pump – not the entire quantity of ethanol as in a manual reservoir burner. With a manual combustion block, the fuel itself is heated (often several quarts), so inevitably odors will be emitted due to the aromatic components present in all alcohols. With an electronic device, there is no odor at all. The reservoir remains cool and is sealed. Only a few centiliters of alcohol are injected, and all is burned immediately. Do I need a Professional to design and install an aFire USA Fireplace? Installing an aFire USA electronic fireplace is relatively simple. Installation can be completed in only a few minutes and requires no special knowledge. Our range of complete fireplaces are delivered “ready to use” out of the box. Burners are meant to be inserted into a pre-designed and constructed housing, but are also delivered ready to use. Just insert them in their housing and you are ready for your first fire. We recommend that you always read the “device installation and usage manual” included with all aFire USA products and to refer to our website for additional information. Installing an aFire USA remote-controlled insert is simple, but designing a ductless fireplace that blends perfectly to your style and decoration is the job of a designer. Professionals in outfitting and interior design have the required experience to help design a space fitting your design and space requirements. They can personalize your décor and living space adding their expertise in creating a fire area. Enlisting a professional guarantees a successful fire area. To create a well-designed fire area experience and skill is important. Building décor requires knowledge of materials and their use within the living space. Installing electric power and integrating it into the insert housing is a job for a building professional. A construction project manager will provide technical knowledge and can guarantee proper and safe installation. What is electrical power is required? Any electric outlet will work (from 100 to 240 volts – 50/60 Hz). aFire USA provides a 12V adapter you just need to plug in (similar to a laptop computer). Besides the flame, does the aFire USA combustion block heat up? The aFire USA insert remains cool (except for the flames and the burner tray). It can be fitted into any type of housing. However, it is necessary to use non-flammable materials above the burner (see next question). What materials can be used around a burner? Do I need to ventilate the lower portion? An aFire USA combustion block can be fitted into any type of sufficiently sturdy and fixed housing. Above the burner any materials which may come into contact with the flame or be directly heated by it must be non-flammable. What are suggested minimum clearances for burner of fireplace installation? How do I determine the size of the cut out for my burner? To the length, add 0.60” to the bottom tank measurement. To the width, add 0.44” to the bottom tank measurement. Since the insert remains cool, it is necessary to ventilate the housing? The holes in the lower shell of the burner only serve to reduce the weight of the burner. To understand the required margins for installation of a burner into its immediate environment, contact us by email with the model of the device you are installing and we will provide a technical drawing for your product with the required installation measurements. If the fireplace is attached to a wall, it must be sufficiently solid to support the attachment and the weight of the fireplace. If the fireplace is placed on the ground, it should be attached to prevent it being accidentally knocked over. Ensure the fireplace is clear of draperies and wall hangings. It is imperative they do not come into contact with the flame (consider existing air currents, etc.). Installation of the device itself will only take a few minutes. However, creating the surrounding design and the decoration will obviously depend on your project. aFire USA devices require no maintenance. Besides ethanol and electric power, is anything else required? Can aFire USA inserts be considered as heating? aFire USA fireplaces are not meant to be a primary heat source. However, they do provide a source of heat and comfort that varies depending on the type of device. They are quite efficient as 100% of the heat generated remains in the room. Unlike a traditional fireplace, the heat is not lost up the vent. Even though we do not provide installation or direct servicing, the aFire USA technical and sales departments will advise and guide you in choosing and designing your fire area. If you wish, feel free to attach a sketch or blueprint to your email request.